Our system defaults to NOT allow employees to add or edit their own shifts. If you allow employees to edit shifts they will be able to see an “Edit Shift” link when they click on their own published shift. If you allow them to add shifts they will then see an “ADD NEW SHIFT” button on their “My Schedule Weekly” view. No (only managers can change shifts) This is the default and means only managers with permission to edit shifts can change shift information. Edit Own Descriptions Only: Lets ALL employees edit only the descriptions of their own published shifts (ex. to note something that happened or information about that shift) If managers have set up to be notified when a published shift is changed, they will get a notification that includes the old description and the new description. Edit Own Shifts (All Fields): Lets ALL employees update all editable fields for their own shifts (Start & End Times, Duration, Description and if allowed: Category & Color). Add and Edit Own Shifts: Lets ALL employees update all editable field for their own shifts and ADD new shifts for themselves on published weeks. Shifts can only be added for positions the employee can work, and new shifts cannot overlap their existing assigned shifts or approved time off. 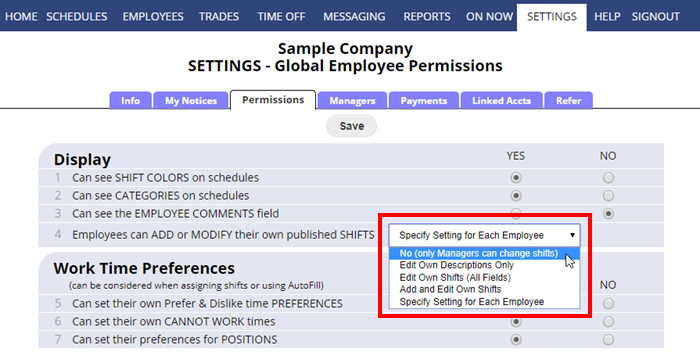 Specify Settings for each employee: This allows managers to individually set the add/edit shift permissions for each employee on their Edit Employee page. No (Only Managers can change shifts): This is default which does not allow this employee to add or edit their own shifts. Edit Own Descriptions Only: Allows this employee to edit their own shift descriptions on published weeks. Edit Own Shifts (All Fields): Allows this employee to change all editable fields for their own shifts on published weeks (Start & End Times, Duration, Description, and if allowed, Category & Color). Employees cannot change a shift’s position. 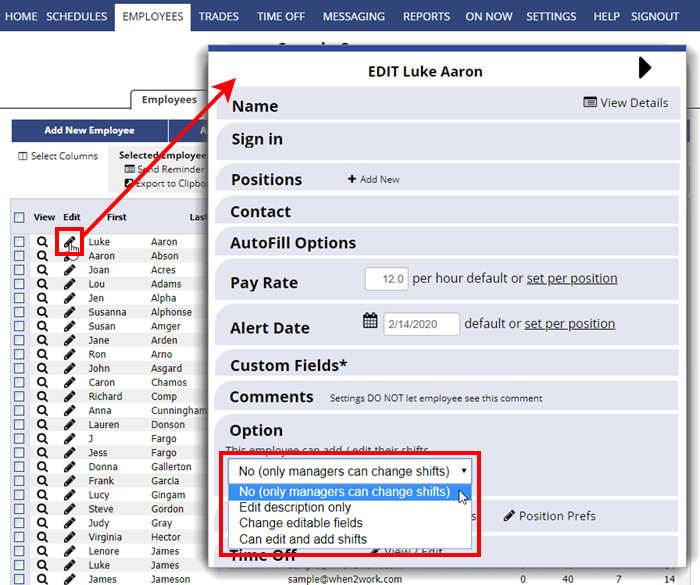 Add and Edit Own Shifts: Lets this employee update all editable field for their own shifts and ADD new shifts for themselves on published weeks. Shifts can only be added for positions this employee can work, and new shifts cannot overlap their existing assigned shifts or approved time off.